By this time of year in western North Carolina, we have had at least one if not more frosts. But this October has brought unseasonably warm days, with no hint of frost. The bees are foraging for whatever nectar and pollen they can find. And surprisingly, they are finding plenty of pollen and I would dare say nectar as well. Normally, by this point in October, the leaf season is either at peak or nearing peak. But the warm weather is also affecting our leaf season providing far too many green leaves at this time of year. At this point, I figured I would be wrapping up my feeding and putting my final preparations in place to close up the hives for winter. But the bees are still drawing comb, creating honey, and raising brood. So the watchword in Beorn’s Acres Apiary is feed, feed, feed! To keep the bees from eating their winter stores, I am feeding them every few days. As you will see shortly, some are eating like there is no end in sight, while others are barely taking the sugar water. Mysteries and interesting activities are abounding in the apiary this fall. This week I’m going to talk a little more about my plans for next season. But before we discuss the next season, let’s talk about some updates from the apiary. Last week, I inspected Hive Acquitaine, Hive Olympus, and Hive Rome. I am trying to alternate inspection weeks on my hives now that cooler weather has arrived. I am attempting to disturb the colonies as little as possible while maintaining a check on progress. So this week, I inspected Hive Florence and Hive Rome. As is usual during an inspection, there were many observations to make from the inspection. With two weeks passed, I wondered what I would find in Hive Florence. This colony began my first season of beekeeping as my strongest colony. It had a small setback when a swarm took place while I was traveling for work. But, it has roared back in strength since I requeened it. Beatrice II has proven to be a very healthy egg-laying factory. Hive Florence has proven to be quite adept at draining their hive-top feeder in about two days. Yet again, they did not disappoint. I filled up the top hive feeder on Thursday morning. So a little less than two days to drain the feeder. There were some small hive beetle larvae in the feeder. I extracted as many of those as I could find. As long as they stay contained in the feeder, I am not too terribly concerned about small hive beetles. Their season is quickly coming to an end. I did notice that the bees had built wax all over the top hive feeder in the two weeks. Little did I know that they had also connected the top hive feeder to the frames of the medium box. But I quickly discovered it when I tried to remove the top hive feeder from the hive. I felt a couple of medium frames lift with the feeder and quickly stopped pulling. Looking down through the top hive feeder, I saw the problem. My ever-industrious workers had sealed the frames to the top hive feeder all along its opening for them to access the reservoirs. I had to break the wax all across the opening and then I could finally lift the feeder of the hive body. Even though it is October, this colony is busy creating wax and drawing burr comb. 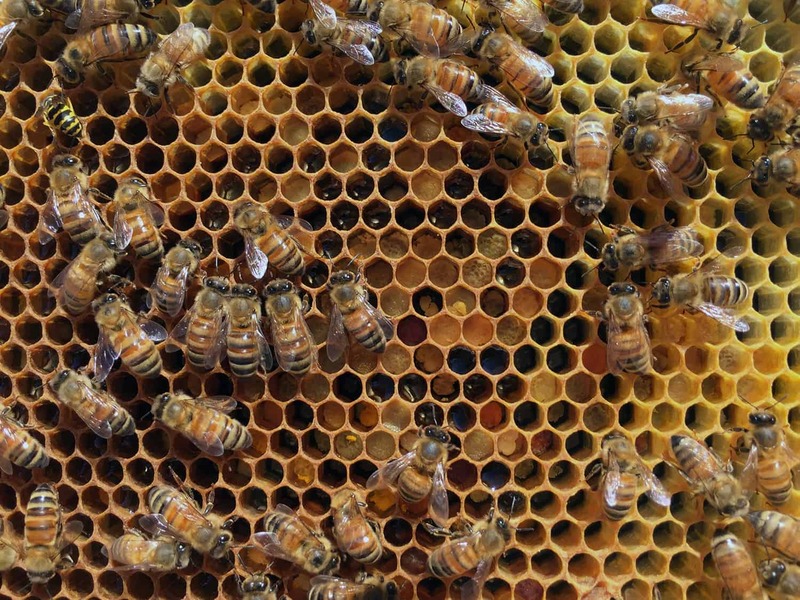 The workers managed to fill every bit of the burr comb and atop the medium frames was filled will honey – sugar water honey – but honey nonetheless. After I cleaned off all the burr comb, I began examining the frames in the medium box. 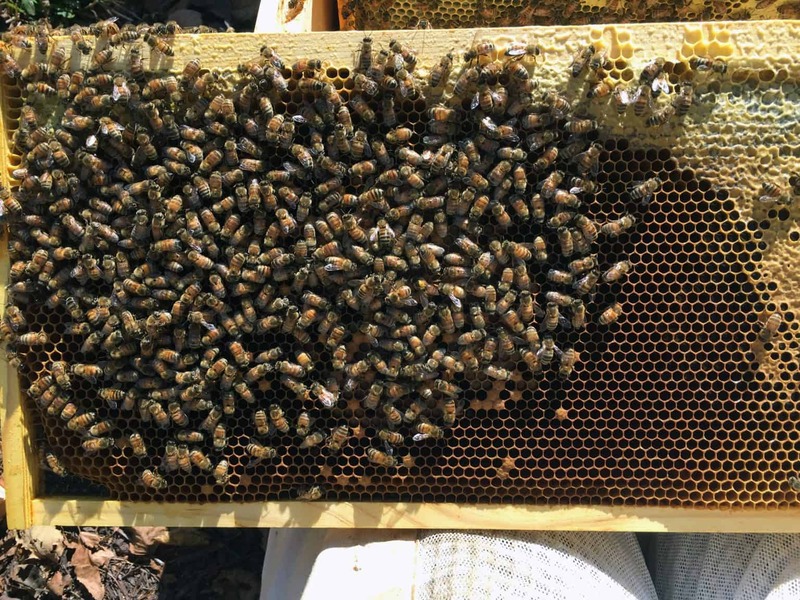 Since my last inspection, the workers have not only drawn comb on the two empty frames I put in the hive to replace the two frames of honey that I transferred to Hive Acquitaine, but had also filled that comb with honey. They are actively working on solidifying an amazing amount of honey for winter stores. 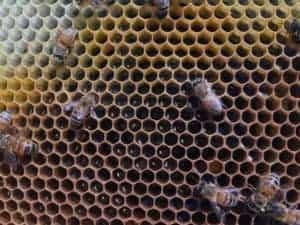 Given the warm weather, they will likely have not only replaced but increased the amount of honey stores in the medium box. Completing the inspection of the medium box, I moved on to the upper brood box. I was hoping to see plenty of honey as well as plenty of brood. 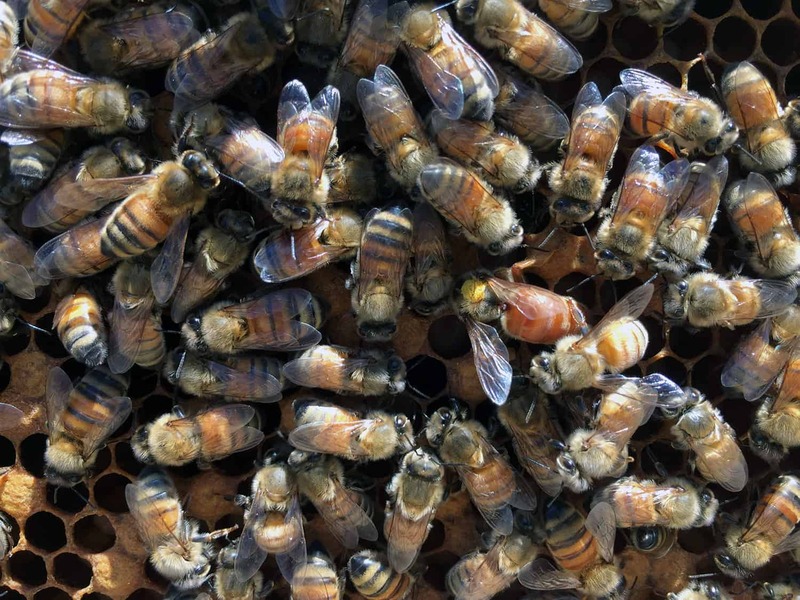 October is the month when winter bees are raised. So it is critical that the colony be queenright and raising brood in October. The good news is that this colony is full of honey stores. The outer frames were filled with honey stores. These deep frames are filled to overflowing and extremely difficult to lift. I will need to rebalance the honey stores prior to closing the hive for winter. In addition to significant honey stores, I found plenty of capped brood. I also found eggs and larvae. Particularly concerning, I found two empty queen cups in the swarm position. I will likely take a couple of frames and unite them with Hive Rome. I don’t believe they will attempt a swarm this late but better to take no chances. I destroyed both empty queen cups but I am sure they will be back next week. I finally found Beatrice II on the tenth frame looking for a cell deep enough in which to lay an egg. Rather than further disturb the colony, I began reassembling it and refilled the top hive feeder before closing the colony. Prior to my final closing of the colonies for winter, I will need to thoroughly inspect each of the colonies moving from top hive feeders down to the bottom brood boxes, re-balancing honey frames to the exterior of the boxes and leaving any brood in the centers of the boxes. To say that I am elated by this colony’s progress is an understatement. This colony endured relentless weeks of robbing attacks. At one point, I feared that this colony was a lost cause. But through it all, they plodded along and persevered. And now the colony has stabilized. For the first time in a month, the colony has produced significant honey stores. There have been a few minor robbing attacks thanks to my neighbor who continues to not feed her bees. Last week, I began feeding this colony raw pollen in addition to their sugar water. 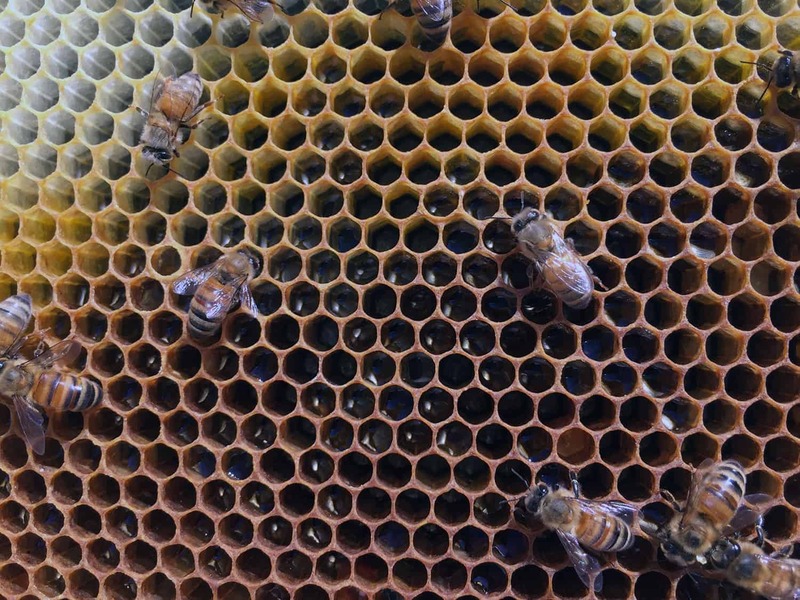 As you will see in the photos of this hive, the workers have put these pollen supplies to good use, storing plenty of pollen stores as a result. These added pollen stores have caused Cornelia to increase her brood production. To assist them, I added a frame of mostly capped brood, nurse bees and honey from Hive Florence. This will assist Cornelia with a larger population of bees and help get them ready for winter. Hive Rome will need to be fed and monitored all winter. I did not inspect Hive Acquitaine this week. I am trying to disturb the colonies as little as possible during this season as they are already defensive. But, like Hive Florence, they had largely drained their top hive feeder. So, I refilled the feeder and sealed the colony back up. I didn’t inspect Hive Olympus either. Unlike all my other colonies, they don’t seem to be too terribly interested in the sugar water having taken only a small portion of it. This observation left me wondering what is going on in this colony. I will be opening it up for an inspection next week (likely Friday when I return from Portland, Oregon). I closed the colony after refilling the top hive feeder. What Does Odd October Weather Portend? As I mentioned earlier, western North Carolina is used to a normal progression of seasons including some quite cold and snowy winters. But with the appearance of global warming, western North Carolina is experiencing drastically hotter summer, warmer than normal falls, early warmups prior to spring, and brief durations of cold weather. In the last few years, it has not been uncommon to see honeybees out foraging on dandelions in December. And that includes Christmas Day where in the past we were used to snow storms on Christmas Day. These climatological changes are altering how we care for our bees here in western North Carolina. Warmer weather during the fall is causing all of us to have to feed for longer periods of time. By this time, we should have had to stop feeding sugar water as it would have been freezing. But it doesn’t appear that we have true extended cold weather in the near time forecasts although I can report that Tuesday morning (mid-October 2017) saw a morning temperature of 35° F which is a good sign for impending cold weather. Last week, you learned that I have been busy planning for next season. So, this week I want to provide an overview of my plans and will start providing more details as I flesh out the agenda. This summer, I learned just how difficult it can be to find replacement queens produced locally. So, as a result, I began thinking about the possibility of raising queens. I have had mixed results to date in raising queens in my own bee yard but that could be due to the lack of readily available drones. Plus, you really don’t want your queens mating with their brothers so you need an “out yard” in which you can position your virgin queens. 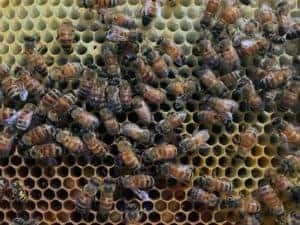 So the first of my plans is to obtain a queen castle and locate it in a larger apiary in the county to begin the process of raising locally produced queens. To aid me in understanding the issues with queen rearing, I will be doing plenty of research and reading during the winter months. 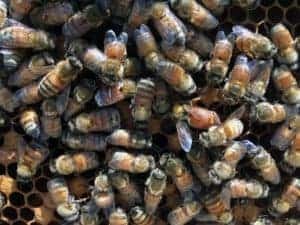 But, I also will be working with my fellow beekeepers in the local beekeepers club to locate potential apiaries that would be willing to allow me to situation my queen castle. There are lots of considerations to locating a queen castle. For me, I will want to know that this apiary tests for varroa mites, monitors the hives, and has a large enough critical mass of colonies to provide significant numbers of drones. Last week, you also learned that I purchased a Resource Hive. That purchase gives me the potential to have four nucs in production at one time in my apiary: two 5-frame nucs and two 4-frame nucs. Given that I will have four hives (if all goes well this winter), I will potentially end up with four splits to forestall swarming next spring. With that potential, I’ll have the possibility of four hives and four nucs all operating at the same time. In many respects, nucs can be a more lucrative business than selling honey. This activity is something I’m interested in doing, both as a furthering of my beekeeping and as a potential side business to fund some of the costs of my new beekeeping interests. There are definitely a couple of important considerations that I have had to examine before undertaking these plans. Most importantly, you have to know if and when you need to be licensed by your state to sell nucs. In North Carolina, it happens to be selling more than 10 nucs in a season. A beekeeper is required if they are selling a large number of nucs to be inspected by the regional bee inspector. Even though my production in this first year, an experimental year, will likely fall below that level, I’m going to go ahead and get the inspection and pay the fee for the license. Along with making these splits, I needed to think through the process of requeening. 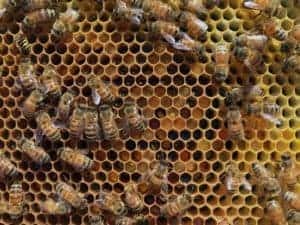 One method you may use with a split is to move the existing queen along with brood and honey into the nuc and let her found a new colony. That is the approach I took with Hive Aquitaine which yielded Hive Olympus. 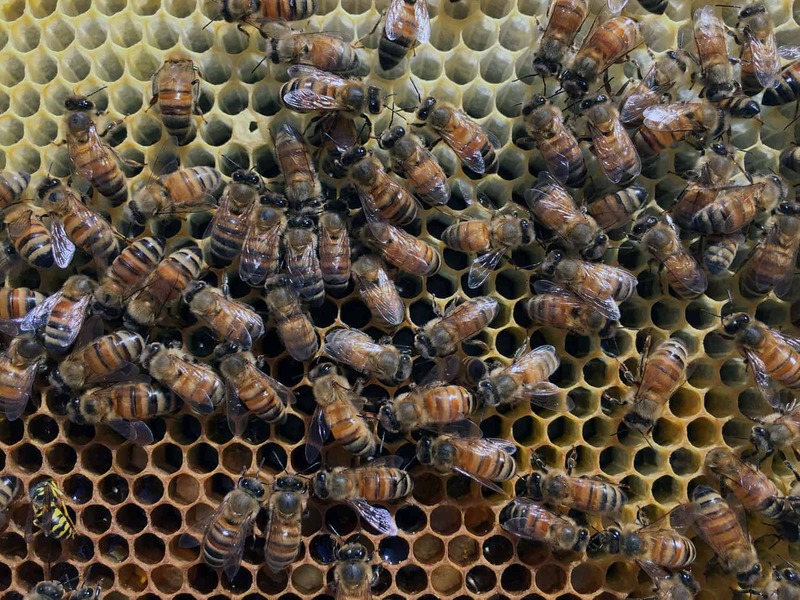 But, another approach is to move a frame with queen cups and a couple of frames of brood and honey giving you a larger colony that is queenless. You then let the colony attempt to raise and establish with a new virgin queen. A third approach would be to move the queen out of the colony with the split (think process one above) but then re-queen the original hive using the queen cups already created as part of a queen castle production producing mated queens. I am going to use this third approach where I split the colony with the old queen to make the nuc, move the queen cups into a queen castle and raise virgin queens (and hopefully mated queens), and then re-queen the original hive with a purchased queen. It is a lot to think about and there are more things I need to think through but this gives you an idea of where my thinking is currently. Next week, I will update you on the progress of my colonies now that we actually have some temperatures in the 30s. As well, I’m going to continue giving you more details on my plans for next season. So, stay tuned and watch out for the next blog post.